Remington Golden Sabers are a popular choice for self defense. 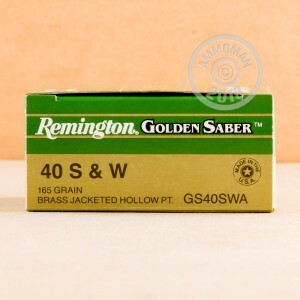 Combined with the hard-hitting .40 S&W cartridges in this 500-round case, the Golden Saber bullet is a great choice for self-defense in your Glock 23, Springfield XD, Smith & Wesson M&P or other handgun. The spiral-cut brass-jacketed bullet offers superior penetration and expansion in the target without the overpenetration of FMJ ammo. 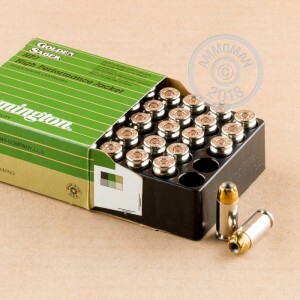 These rounds use a light 165 grain bullet to achieve a higher velocity and more pronounced mushrooming. 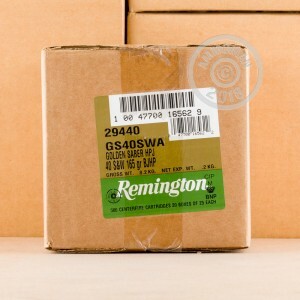 Each cartridge in this box of 500 (20 boxes of 25 rounds each) uses non-corrosive Boxer primers and reloadable brass cases which are nickel-plated for improved corrosion resistance. At this price, shooting what you carry has never been more affordable. AmmoMan.com guarantees free shipping for any orders over $99. You pay only the up front list price. I haven't shot any rounds yet so I can't comment on how good it is but I can say order arrived so quick, about 3 days after purchasing. Definitely recommend Ammoman to anyone wanting to stock up on ammo. Top notch service and awesome prices!